As Luck Would Have It? Right now, I’m nursing a broken heel. For you in the medical community, I fractured my calcaneus. The good news is unlike so many other people, I didn’t end up shattering two other nearby bones. The doctor said I broke it in the best possible place. Chalk it up to all of those years of drinking milk. It does a body good, ya know! So how did it happen? 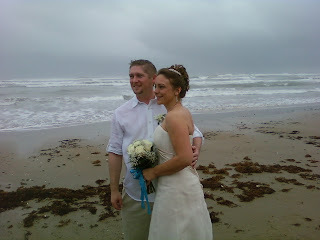 I went to South Padre Island to see one of my best friends get married. You’ll see the pictures in a previous post. 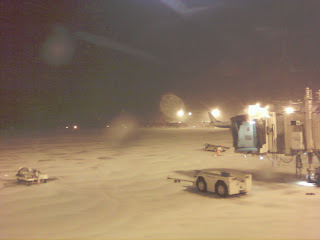 We flew from a snowy Cleveland Hopkins to a sunny Houston and Harlingen. Once we got in the Valley, we checked for a car, but out of five different rental places, none of them had a spare vehicle to rent. 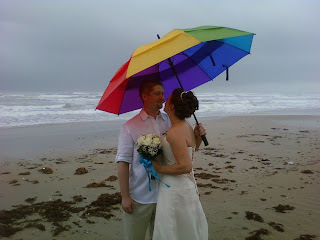 My girlfriend struck up a conversation with a couple from Illinois and as luck would have it, they offered us a ride to South Padre Island. Their generosity saved us hundreds of dollars. They were nice people. 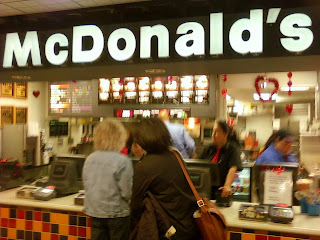 We offered them $40 but we settled on them taking $20. Once on the island, we got to check into our hotel and see the Gulf just before dark. We headed over to Wahoo Saloon, said hello to the locals before heading to Amberjacks. The owners remodeled the place and it looks swanky. We had some great food but the dessert was the bread pudding. It was delicious. The next morning we got to see my friend, Phil. It was simply awesome to see him in person after a year. We got to see Beau’s parents as well. We watched the waves from Wanna Wanna and went back to the hotel to see Beau & Angel. I’m so happy for them and their life together. Friday night was the rehearsal dinner. We caught Angel looking lovingly at Beau. I don’t think she thought anyone was looking but I wasn’t the only person who saw her glance. I raced over to everyone else and before I could say anything they blurted out the same observation. 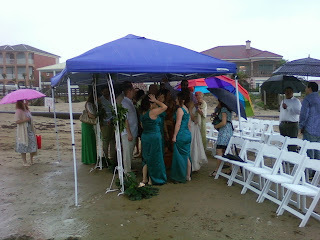 As luck would have it, it rained during the entire wedding. But as they say, the show must go on. 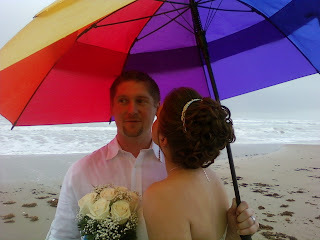 We hurried through the ceremony, at times, you couldn’t even hear the woman officiating. But Angel and Beau were married and it was, in the end, an unforgettable ceremony. 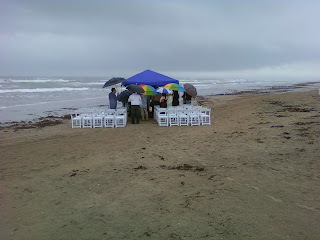 After ironing out all of the rain from my soaked clothes, we went to the reception. It was a intimate affair. At the end of the night, we decided to get into the heated whirlpool. I wanted to see how cold the pool was so I jumped in, I thought it was six foot deep, as luck would have it, it was only three foot deep. I immediately knew something wasn’t right. I couldn’t walk on my foot at all. 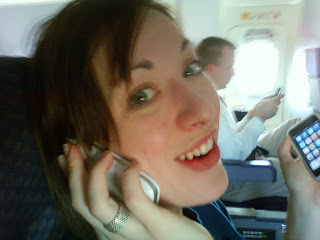 I nursed it that night, the next morning we needed to catch an early flight. It was Sunday and nothing that had crutches was open. As luck would have it, our last ditch effort, a Walgreens on the way, had crutches, allowing me to manuever through the airport. After meeting with Phil in Houston, airport workers helped wheel or cart me through the terminal. 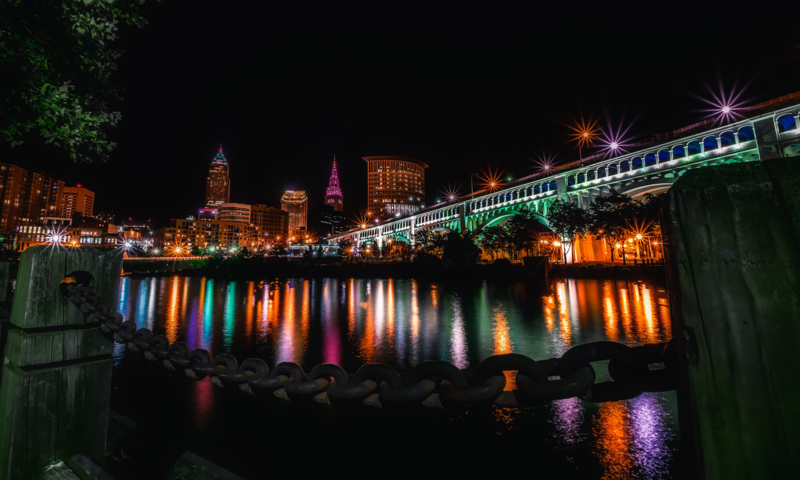 As luck would have it on our way back to Cleveland, we sat next to a Cleveland Clinic doctor, Dr. Andrew Stephenson, who recommended Dr. Brian Donley. I was able to get into see him yesterday and he gave me the good/bad news. I broke my heel but it wasn’t as bad as it could have been. When I was a kid, I hated pizza with a capital “H-A-T-E-D”. I don’t know why. Maybe it was to be different, maybe it was because I didn’t like tomatoes, maybe it was because I was sometimes a stubborn kid who just didn’t want to like it because I didn’t want to like it. Today, I love pizza. It has all of the major food groups in it. It’s an everyman’s food. If you could just put potatoes somehow on it. Love me some potatoes. Ahem, I digress. In college, there was a Pizza Hut up the street and every time I could scrape together enough money, I’d get a Supreme Pan Pizza with black olives and I’d commence to eating on it. (My homage to Narm, we’re country boys). That pizza would never fit into the dinky refrigerator we had in our dorm so that leftover pizza would sit out all night long. Did I throw it away for fear of food poisoning of some sort? Heck, no, I’d commence to eating it for breakfast the next morning. I love some Pizza Hut pizza. I had some last night and this morning in true taawd fashion, I had some for breakfast, sure it sat out all night long again but am I worried? Heck no! Pizza Hut pizza is almost better the day after you get it. Oh, I wish I’d remembered to tell them to put the black olives on it this time. Oh and right now, they’re offering a medium one-topping pizza for a cent when you buy a large pizza. What a deal, talk about a way to beat the recession! When I was a kid, I enjoyed wearing slippers. Actually, when we lived on the farm, drafts in that old house encouraged the wearing of the slippers. One of the best parts about the farm were the registers that were in the floor. When the heat came on, we all ran to the registers to stand on them. That would warm your tootsies. Now, I’ve become obsessed with always wearing slippers indoors. Not necessarily because of how cold or warm my toes are but because I hate getting my socks all dirty. If you have hardwood floors, like my sister does, people’s socks pick up any dirt on the floor. Think Swiffer. Of course, I’m not saying my sister keeps a dirty house, that’s not the case, but you can’t sweep the floors 24/7. I’ve taken to transporting my Dearfoam slippers with me on the road. I, ahem, wear them at work. When I go to my parents, relatives and other places that I’ll be spending any sort of time. Now, I guess I just need a housecoat and a pipe. I’ll admit, I’ve learned some things during my life. A lot of that knowledge, I feel, has come over the past years. Actually, I may have always known it but I think now, I’m starting to really practice it. I find myself preaching to people to stay positive. Negativity attracts more of negative energy. It’s a magnet. On the other hand, being positive only attracts positive energy. Worrying was something that, at one point of my life, ruled me. I’d hear bad news, think of bad things and worry myself sick, literally. How did I change? I realize worrying is wasted energy. It does not change anything in the future. It simply ruins the present. I believe you can’t change the future. What’s supposed to happen, will. Whether you believe it’s divine intervention, the universe playing itself out or fate, I think there’s very little you can do to change what’s going to happen. Now, I look at life like a lazy river. You float down it and have fun along the way. If you get stuck, you give yourself a little push and continue on down the stream. It seems simple to say but a little harder to live. I’m using it to help guide my life and allow faith to lead me down the path that’s the right one for me. I’ve always admitted to loving snow. I can’t wait for the first time it happens each year. Nothing gets me in the Christmas spirit like a good “Charlie Brown” snow. I love it. I have to admit I’m not loving it as much right now. The last time I can recall seeing all of this snow was back in the 70’s during the great blizzard. Every time I’m out and about and the wind is whipping around, slapping me in the face, I remember fighting Mother Nature back then to get home. My parents heard the weather reports and decided to go “into town” to get some groceries before the snow hit. I had to go with them. Of course, going into town meant traveling about 3 miles, if that, to the two-aisle general store. John Etling owned it and kept the little town of Sterling stocked with groceries. We didn’t have a big IGA like people did in Rittman. We didn’t have a big supermarket like Buehler’s or Hawkins like they did in Wooster. We rushed into our little town to get milk, bread and everything else my parents thought we’d need before the storm hit. We got back into the car and zoomed back home. The cinder topped Frick Road didn’t contain a lot of homes. There were only four houses on the street. The township road crews didn’t give it a lot of priority. By the time we got half way to our home, my dad made the decision to turn around and attempt coming in from the other direction. Snow had already blown the bottom part of Frick Road close. The top part of Frick wasn’t much better. Winds whipped across the bare fields that just months before contained corn, hay or soybeans. My dad’s Chevy truck got stuck and it was decided we’d walk the rest of the way back to the house. I was just a little kid, about 5 years old and walking wasn’t an option for me. My dad carried me, some groceries and a gallon of milk. I wanted to see what was coming at me. It was only one thing, the wind carrying face piercing snow flakes. My dad implored me to turn around. I would listen to him for so long and then get curious again to see where we were going. The winds hit my face again. The weight of it all was too much for my dad. He had to drop something and it wasn’t (thankfully) going to be his son. The groceries had to be dropped until he could get me home. My mother walked right beside us, trying to get to the house as well. Finally when we got there, someone had to go back out and get the groceries and the milk. My dad took the task and believe it or not, found the groceries and the milk. Milk=white, snow=white = tough job. 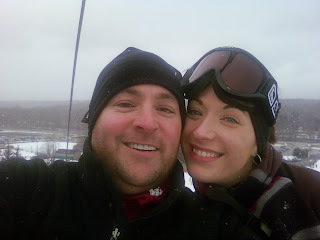 So as the snow falls, I have to think back to a time when I didn’t worry about my job, money, relationships, my future. I just wanted to see where I was going. I guess I still do.